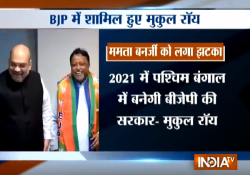 One of the co-founders of Trinamool Congress in West Bengal, Mukul Roy, on Friday joined the BJP. Roy is a known face in West Bengal politics, a politician having grassroot support. He had left the Congress along with Mamata Banerjee more than two decades ago and formed the Trinamool Congress. He was number two in the party hierarchy, next to Mamata Banerjee. He was the party general secretary, its vice-president and was member of Rajya Sabha twice. It was Mamata who made him the Railway Minister to replace Dinesh Trivedi. The two fell out a few months ago, after Mukul Roy was named in the Saradha scam and Narada sting operation. Mukul Roy resigned from the party after he was sidelined by Mamata Banerjee. His joining BJP is a big loss to the Trinamool supremo. On the other hand, the BJP, which lacked a big political heavyweight in West Bengal, was more than eager to get Mukul Roy in its fold. It is true that whenever BJP will raise the Saradha and Narada scam issues, Mamata Banerjee will naturally question why BJP admitted Mukul Roy into the party. I do not know whether the BJP has prepared its answer to this inevitable question.